A part of the future of Bridgeport was relegated to a small red plastic bowl and five scraps of paper Friday morning. And it wasn’t a bad thing. At 10 a.m. in the conference room of the Bridgeport Municipal Complex, City Clerk Donna Krivosky held a ballot drawing to determine what order individuals would be listed on the ballot for the upcoming 2019 City of Bridgeport election. Filing for the June 11 election ended at 4 p.m. Thursday. When the deadline arrived, six city residents had filed to run for a seat on the city’s governing body. Only one individual filed for the position of City Recorder and that was Dr. Harry “Hank” Murray. Murray is an incumbent and with no challengers needs one vote to secure another four-year term. The other five individuals filing – in the order in which they field – for two seats were incumbent Jeff Smell, Donnie Tate, Don Burton, James Yeater and Adam Starkey. Incumbent Lowell “L.J.” Maxey opted not to seek a second term. The election is nonpartisan Any person who was a qualified voter of the City of Bridgeport had the ability to file to run. 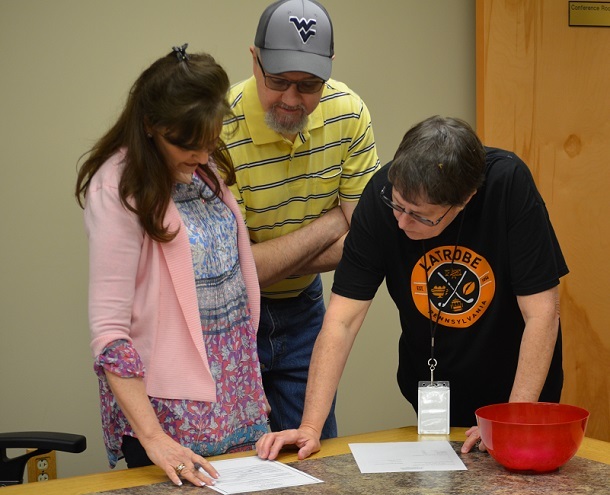 Editor's Note: Shown, from left, are City Clerk Donna Krivosky, and Ballot Commissioners Kevin Musgrave and Carole Kinard.